DOOD! I'm working out an XBOX mod too!!! you seen my watercooled one? I can show more details of my project until September probably but you will like it. Sure yours will be better. Hope to see you at QuakeCon Craig. I consider you truly to be a friend even if we rarely see each-other because we have common bonds beyond modding. I am planning on being there bro, and I dunno about the &#34;sure yours will be better&#34;.... I'm trying to come up with a concept of &#34;ruggedizing&#34; a 360 so that my wifes Godson can take his 360 to Afghanistan when he deploys. I look forward to seeing you again and I am honored to have you as a friend. Hey, if either of you need spare 360 parts, hit me up. 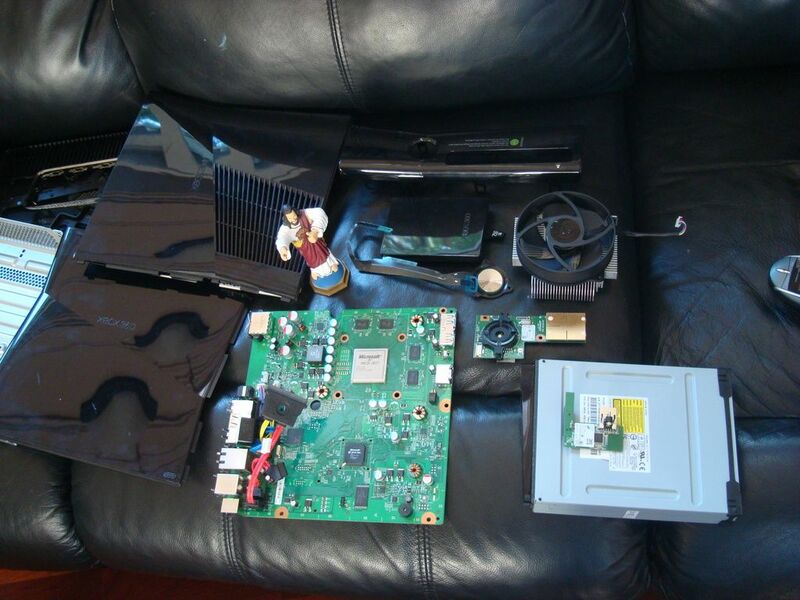 I was given a 360 that (according to the previous owner) had no video going out but everything else working. I've heard that the problem is just because of the 360 to TV cable but I don't know since I don't have anything for it and it has no hard drive. Just as a heads up, when I was taking it a part a put an inch crack in the top gray perforated piece (don't even notice it) and I broke one of the tabs off on the bottom gray piece (the flat one that doesn't have the recessed area...still have the tab). 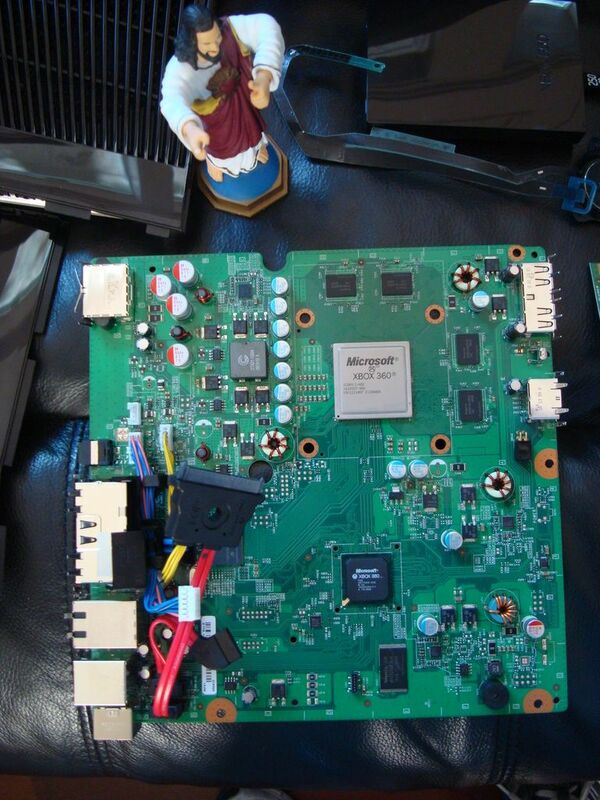 It looks like the it had been modded so the fans got more juice to spin faster so one of the black wires that connect mobo to dvd drive. It's a white one, too. I hadn't seen a W/C Xbox yet but it makes even more sense than a W/C PC! Nice work DB! One question. I assume the cuts in the front of the case were made with a Dremel? If so how do you then polish them to make them look so clean? Also, if again using a Dremel tool do you use the router set up or just freehand it? Possibly looking to do some of this after my next mod is finished. Still have the DVD drive? Mine went out. 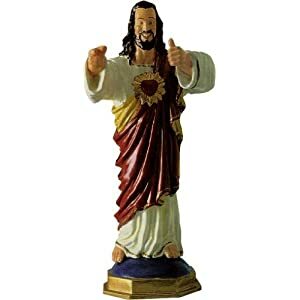 Any mod with Buddy Christ has got to be good! Yeah, still got the DVD drive from it. Still in-tact and everything, warranty sticker hasn't been removed/messed with so no one's opened it. If you need any of the info off of it, just ask. Oh, and, Thumbs Up Jesus made Dogma even better.